Nowadays, there are easier and quicker ways other than lock picking for burglars to gain entry into your home. Lock snapping is one of them. Using pliers or a hammer, they snap the lock cylinder into two in a matter of seconds. It’s fast and it doesn’t require any special tools or skills, making it popular among burglars. Once the cylinder breaks, it’s easy for the burglar to access the dead bolt or any other locking mechanism you have in place. Locks with a Euro Cylinder profile and those with protruding cylinders are at the highest risk of this burglary technique. The solution is not a stronger dead bolt or a thicker door. Neither of these will help if your lock is still vulnerable to a lock snapping attack. The best solution is an anti-snap lock. An anti-snap lock is designed to reduce or eliminate the risk of snapping. For one, the bar is much stronger and hardier. It can resist more force than normal locks. Additionally, most anti-snap locks are designed with sacrificial sections that snap off when force is applied. Once a section breaks off, it’s harder for the burglar to grip the recessed cylinder and break it. When shopping for an anti-snap lock, the most important thing to look for is TS007 certification mark. This means the lock has been designed and tested to withstand snapping as well picking, bumping and drilling. Below, we review the best anti-snap locks available online. They provide the best protection for homes, offices and business premises. With TS007 3-star certification, the Avocet Euro cylinder lock can resist snapping, drilling, bumping and picking. The diamond grade cylinder is extra-strong and can withstand snapping attacks. In most cases however, it won’t need to display its strength. That’s because the lock has another trick to prevent snapping. As soon as it detects an attempt, the molybdenum cam locks into position to secure the lock. With molybdenum being much stronger than steel, the cam can easily resist any snapping and twisting. Another security feature that makes this one of the most secure locks is the personal key card that’s included with the keys and lock. Without the card, no one can make copies of your keys. The lock is easy to install; it takes less than 15 minutes. Unlike some locks, you don’t have to do any drilling. Also resistant to drilling, picking and bumping. Key card for extra security. If you are looking for secure anti-snap locks for double doors or the front and back doors, this keyed-alike pair is perfect. To protect against snapping, the locks have two security features. One, a hardened steel bar that is harder and requires more force to snap. In the few minutes burglars have to break into a house, it’s impossible to snap this lock. Two, the lock has sacrificial cuts. If a burglar attempts to snap the cylinder, these sacrificial cuts will break off, shortening the cylinder and protecting it against further snapping. The locks can also resist drilling (using anti-drill pins and balls), picking (using anti-pick pins), bumping (using V-pins) and plug extraction. The only downside of these locks is that they have a Kitemark rating, not the newer and more secure TS007 certification. But they should still provide excellent protection for homes. Excellent security features to protect against snapping, bumping, drilling, picking and plug extraction. Keyed-alike pair of locks. Provides the convenience of using a single key for both locks. This is another great, though more expensive, choice if you are looking for two locks for the front and back or a double door. The main advantage of this pair over the Nickel Yale one above is that it has TS007 certification with a 3 Star rating. If you live in an area that sees its fair share of burglaries, these locks provide better security. 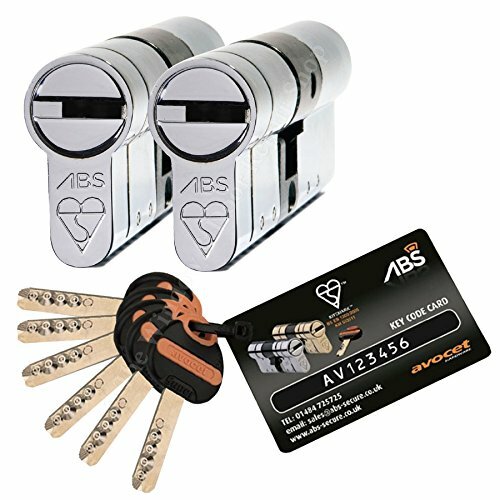 The locks provide the same security features as the single Avocet ABS we have reviewed above – diamond grade cylinder, a locking cam and a secure key card. The locks are keyed alike so you can use the same key for whichever two doors you install the locks on. Excellent protection from snapping, bumping, drilling and picking. Keyed alike locks – convenient one-key access to both locks. Easy to install but make sure you measure your old lock before you buy. This is a good option if you are looking for a budget medium-security anti-snap lock. Don’t expect the same level of security as pricier locks. For one, the Yale nickel lock has a 1-star TS007 rating compared to the 3-star rating of the Avocet ABS lock. But for homes in relatively safe areas, it will do. The lock has all the usual anti-snap, drill, pick and drill protective features. For snapping, the lock combines a hardened steel bar with sacrificial cuts. Even if the burglar snaps the cylinder, they only break the outer part that is intended to snap off under force. This protects the most important part recessed inside the lock. For picking, four anti-pick pins are used at each end. The lock also features V-pins to resist bumping and anti-drill pins and balls to resists drilling. Provides a good level of security for most homes. Resists all manner of attacks including picking, snapping, drilling and bumping. I don’t recommend this lock for major entryways. It uses the problematic Euro profile cylinder that is easy to snap. But for inside rooms and sheds, it’s good enough. This is the cheapest lock we’ve picked so don’t expect top-notch security. It is only ideal for low to medium security applications. The lock guards against three types of attacks: snapping, drilling and picking. To protect against snapping, it has a sacrificial cut that breaks off when pressure is applied. As for drilling and picking, it uses special anti-drill and anti-pick pins. To emphasize, do not use this lock on main entryways. It has no TS007 rating and doesn’t offer protection against bumping. And even for the attacks it protects against, it doesn’t do as good a job as Avocet ABS or Yale. We only recommend the Schlosser Technik lock for low to medium security situations such as bedrooms, a home office or an outdoor shed (that doesn’t hold any valuable tools).